Does Wine Need To Breathe? There Is No Absolute Answer. Honestly, is anything ever easy? Take wine for instance. Most articles pontificate on the benefits of allowing wine to breath but like everything else regarding wine, letting it breathe is open to debate. Proponents of breathing contend that aerating, another word for breathing, softens the tannins of the wines, while greatly enhancing their flavors and aromas. Critics argue that oxygen begins to destroy wine the minute it comes into contact with it. Needless to say, we have our own opinions as well…this would be a pretty pointless post otherwise. Does All Wine Need to Breathe? There is no absolute answer for allowing a wine to breathe. Most red wines that were designed to be aged can benefit from relatively short-term exposure to air, particularly if they are being served on the younger side of maturity. However, if a wine is mature or past maturity, it will probably be damaged by aerating because the tannins have already mellowed. Hint #1 – Wines that were made to be served immediately upon release don’t usually benefit from breathing. These are typically fruitier wines that lack the tannic structure that benefits from breathing. How do you know if the wine was designed to be served right away? The best way is to ask. Even grocery stores will usually have a beverage buyer or manager that has some familiarity with the wine. You can also look at the web site of the winery or brand to see if they offer serving suggestions. The point is, a little investigation goes a long way. If there is no one knowledgeable about the wine and the web site is useless (unfortunately, a far to common occurrence among winery sites), then revert to hint #2. Hint #2 – Always taste a wine before assuming that it needs to breathe. If you’re not sure if the wine needs aeration, pour a small amount into a wine glass, taste it, and then gently swirl it in the glass (don’t splash) for 3 to 5 seconds. If the wine tastes fuller and smoother, allow it to breath. You can do this a couple of times to see if it continues to improve. If it is better, then allow the wine to breathe using one of the techniques or gadgets described below. If it has degraded in flavor, recork it and place it where it will be the right serving temperature when you’re ready to enjoy it. Just don’t test it more than a couple of hours before you plan on serving it to avoid long term exposure to air. Because only a small amount of wine was removed from the bottle, the wine shouldn’t degrade any further before you are ready to enjoy it, assuming that you are going to drink it within several hours. Hint #3 – Very few white wines require any breathing through aeration accessories or decanters. What is the Best Way for a Glass of Wine to Breathe? We did a couple of blind taste tests on devices and methods for aerating a single glass of wine. I don’t get paid by the word so there is no reason to retype all of these. The most successful gadget by far was the Vinturi so instead of rehashing all of that, we’ve just linked to it here. What is the best way for a bottle of wine to breathe? Technique #1 – Decant the wine. This is the easiest method. It also has the added benefit of allowing you to remove sediment from the wine if you do it correctly, but that is getting ahead of ourselves and is the topic for the next post in this series. 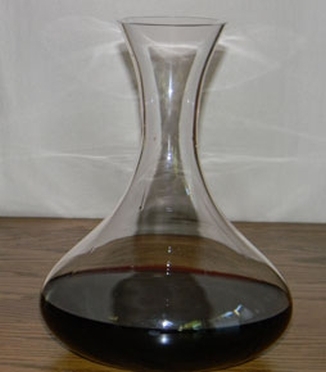 The amount of time to leave a wine in the decanter to breathe depends on the surface area. Assuming the decanter is roughly twice the diameter of the bottle, the wine will aerate in ¼ of the time that it would in the bottle so assume about 20 to 30 minutes. You can also gently swirl it for a few seconds to aid in the aeration. Technique #2 – For heavier reds, the easiest way to let the wine breathe (not the quickest) is to open the bottle about two hours before serving. There’s a common myth that merely opening a wine bottle and letting it breathe does nothing to enhance its flavor because not enough surface area of the wine is exposed to air. Frankly, we think that’s BS because it doesn’t take into consideration the amount of time the wine will be open prior to tasting. Just like a decanter can speed a wine’s breathing time by increasing the surface area, opening a bottle of wine which has a smaller surface area than a decanter, but letting it breathe for a longer time can improve it. It’s a mathematical function of surface area and time. Pour out just enough wine to lower the level below the neck of the bottle so there is more surface area exposed to the air. Technique #3 – If you don’t have a decanter and there isn’t sufficient time to let the bottle breathe, pour the wine into a glass and let it breathe. Typically 20 minutes is sufficient. The problem with breathing wine in a glass is that usually this is done at room temperature. Even well laid plans to serve the wine at the correct temperature usually go out the window if you need to let the wine breathe in the glass, which is usually done at room temperature. We’ll get into wine temperature in part five but serving wine at the wrong temperature is probably the most common mistake that people make. 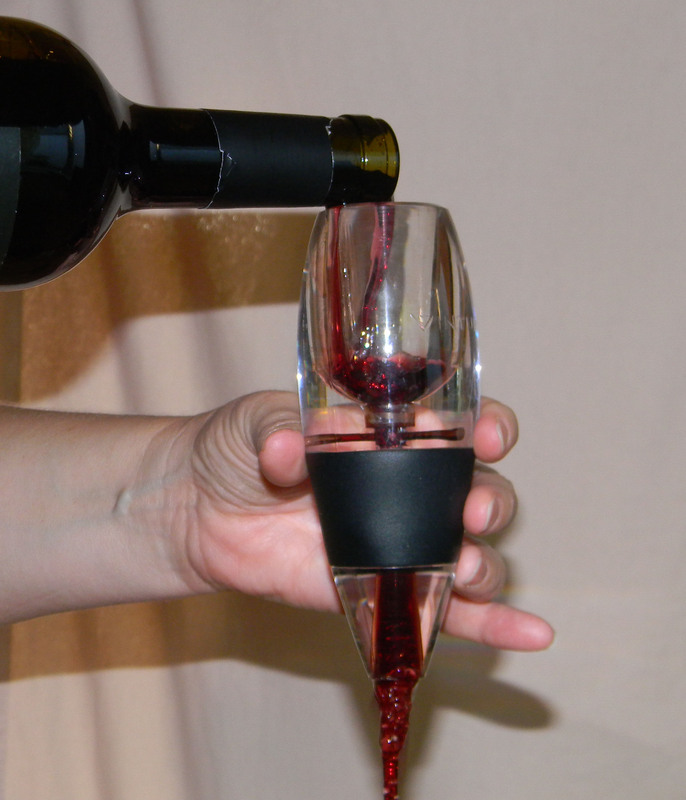 Use this as a last resort unless you have some means of keeping the individual wine glasses at the right temperature. One last point about allowing an entire bottle of wine to breathe. Once you have done it, you’re committed to either drinking the entire amount decanted or throwing the rest away. Once a wine has been heavily exposed to oxygen, it’s well on the road to becoming vinegar and if left too long, becomes undrinkable. Seriously though. Is throwing yourself on the last glass of wine really such a chore? You may find yourself decanting everything, just so you have an excuse to finish the bottle.